Have you made Basic Muffins And Biscuits? 1. Stir baking powder, dry milk and salt into the sifted flour. 2. Sift all dry ingredients together until well mixed. 3. 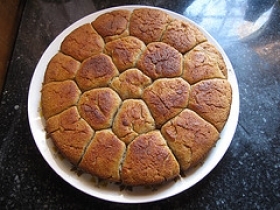 Cut or mix fat into flour mixture utnil all particles are thouroughly coated and mixture esembels coarse cornmeal. 4. Sotre mix in a jar or can with a tight lid. It can be measured into 2 cup amounts and put in plastic bags or jarsd where it will be ready for use. 5. It may be stored at room temperature for 6 weeks. 6. Vary the liquids: dry milk solids are already in the mix so more milk is not need. 7. You can use fruit juice, water or meat broth for the liquid called for in a recipe. 8. The recipes in this Pick-A-pocket book were written for commercial packaged baking mix which has no milk so it is the liquid called for in recipes. 9. This mix is a perfect substitte. Just use water where it calls for milk. 10. 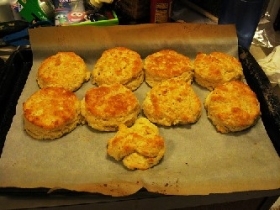 (written out of my cookbook) Basic biscuits: 2 cups mix, 1/2 cup water. 11. Add water to mix and stir 20-25 times. Turn out onto a lightly floured surface and knead 10-15 times. 12. 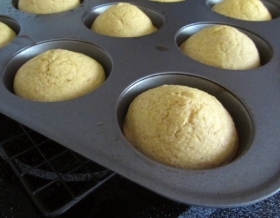 Roll to 1/2" thickness and cut with a knife to pockets shapes or use biscuit cutter to make circles. 13. Place in preheated sm and bake 5 minutes or until golden brown. 14. 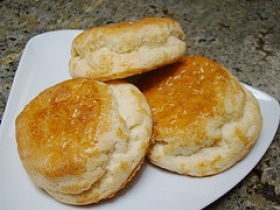 Sausage biscuits: 2 1/4 cups packaged biscuit baking mix(milk), 8 links sausages cooked. 15. 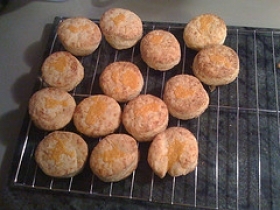 Prepare biscuits according to package directions for rolled biscuits. 16. 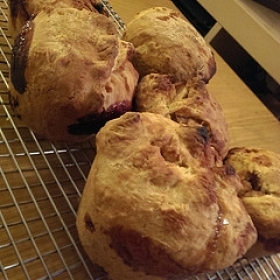 Knead dough, roll out on floured surface and cut 8 circles with a biscuit cutter. 17. Lay one sausage in center of each and wrap dough around, pinching to seal. 18. Sausages will stick out the ends. Bake 5 minutes or until golden brown. 19. 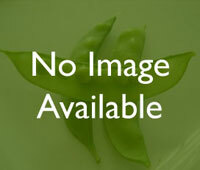 Jelly biscuits: flatten unbaked biscuits with heel of your hand. 20. Place 1/2 teaspoon jelly or preserves in center. 21. Fold over and pinch edges together to seal. Bake 5 minutes or till golden. 22. 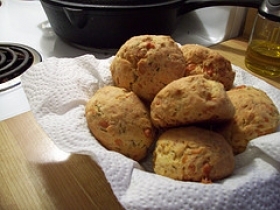 Pimento cheese bread: 2 cups packaged biscuit baking mix, 1 egg, beaten; 1/2 cup grated cheddar; 2/3 cup milk; 2 tablespoon drained dice pimento (optional) Mix all ingredients together until soft dough forms. 23. Spoon into pockets. Bake 10 minutes or until golden.